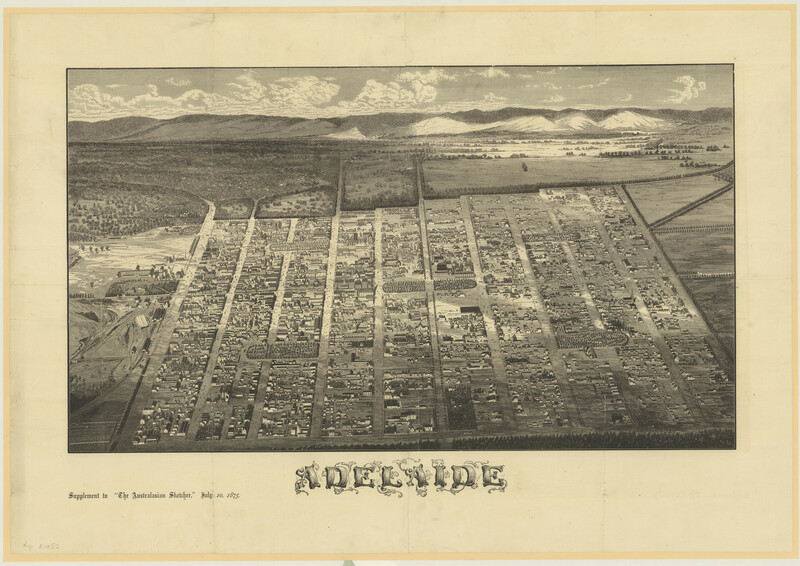 The ‘bird’s eye’ view of Adelaide reproduced in a supplement to the Australasian Sketcher on 10 July 1875 was created by South Australian artist Thomas Peirce. Peirce used an oblique pictorial drawing technique to give a three dimensional impression to his detailed portrayal of the city. The Australasian Sketcher (1873-1889) was an early illustrated Victorian newspaper, based in Melbourne. It was published by Hugh George for Wilson and McKinnon of the Melbourne Argus. From 26 December 1874, the Illustrated Adelaide Post, founded by Adelaide artist and educator William Anderson Cawthorne, was incorporated into the Sketcher. The inclusion of the view of Adelaide and other material relating to South Australia in the Sketcher reflects Cawthorne’s keen interest in colonial life and the local Kaurna people. William Cawthorne went on to found the monthly Illustrated Adelaide Post, South Australia’s first fully illustrated newspaper, in 1867. Jude Elton, History Trust of South Australia, ‘Adelaide 1875’, Adelaidia, History Trust of South Australia, http://adelaidia.sa.gov.au/panoramas/adelaide-1875, accessed 19 April 2019. Amazing I had Great Great Grandparents who were in Adelaide at this time in history Beautiful city even back then thankyou. Great to hear your thoughts Geniene. If you have information on your family history related to any of our articles please consider sharing them by clicking on the 'contribute' button in the top right of the articles. We'd love to read your stories and see your photos. Thanks for the feedback Kate Power. The maps are beautiful aren't they! Stay tuned on Adelaidia for the release of more digital resources like this in the future. What else can I say but - fabulous! Thankyou for such easy access to this beautiful map, when ever I want.